Cannabis entrepreneur Doug West’s profits are going up in smoke. Of the approximately $5.26 million in revenue earned by West’s cannabis dispensary, Mr. Bill’s of Buckley, during the first nine months of 2018, a staggering 37 percent went to excise taxes. Add sales and business-and-occupation taxes, as well as the federal law that prohibits state-regulated marijuana retailers from deducting ordinary expenses because the government considers cannabis a controlled substance, and West’s tax liability becomes burdensome. From pesticide requirements to potential new rules restricting edibles to the nation’s highest tax burden on cannabis businesses, marijuana entrepreneurs say Washington state is strangling the growth of a new industry. “There are a lot of unknowns in our future,” says Vicki Christophersen, executive director of the Washington CannaBusiness Association. State officials began developing regulations shortly after Washington and Colorado became the first states to legalize recreational marijuana in November 2012. Washington eventually adopted a 37 percent excise tax — still the highest in the nation for these budding businesses. In and of itself, that enormous tax hasn’t stifled growth. Cannabis was a $1.37 billion industry in 2017, according to the Washington State Liquor and Cannabis Board, generating $319 million in excise taxes — about five times what they were just two years earlier. More than 500 marijuana shops now operate statewide, and officials have temporarily stopped issuing licenses for retailers, growers and processors — essentially middlemen who create weed-infused products such as chocolates, baked goods and candies from marijuana grown by pot farmers. UP IN SMOKE. A display at the Have A Heart dispensary in Seattle unwittingly evinces the frustrations of many cannabis entrepreneurs. Cannabis sales in the state could reach $2.28 billion by 2020, according to Washington, D.C.-based New Frontier Data, mainly from increased production and competition that will drive down prices and encourage consumers to buy weed legally instead of on the black market. As in other states that have legalized recreational marijuana, Washington cannabis crops are tracked from seed to sale to ensure they end up in state-regulated stores. Illegal weed sales are dropping but still account for up to 15 percent of all transactions in the state — a significant number, says New Frontier Data senior economist Beau Whitney. Rick Garza, director of the Washington State Liquor and Cannabis Board (WSLCB), notes that a bumper cannabis crop resulted in an oversupply in 2018 that sent prices plummeting from roughly $30 per gram to about $7, effectively negating illegal street sales. Those on the front lines, though, face the blunt reality that state policies could seriously inhibit Washington’s cannabis businesses. 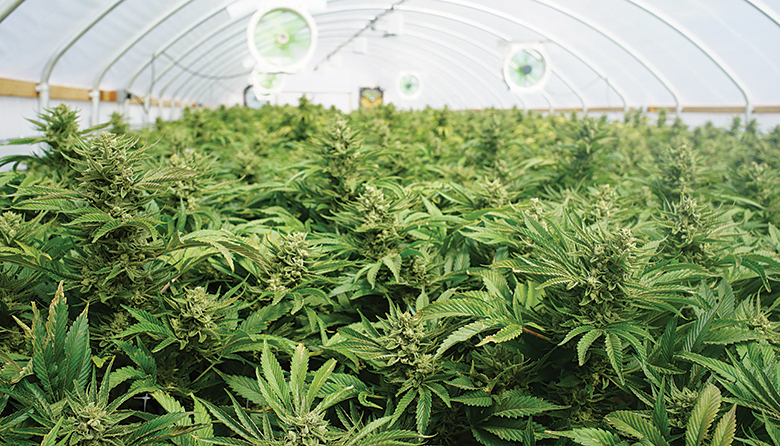 While larger pot farms that supply retailers are thriving, some smaller growing and retail operations have struggled in the past year due to falling prices and onerous regulations, says Joshua Ashby, cannabis practice chair at Seattle law firm Lane Powell. And this reality is creating opportunity for prospective buyers. It’s exactly what Have A Heart is doing. The company operates five stores across the state — including two in Seattle — and recently closed a $25 million Series A round in what it says is the largest private financing for a pure-play, U.S. retail cannabis company. CEO Ryan Kunkel is aggressively expanding to other states partially because Washington law limits individuals with financial or ownership interests in a marijuana shop to just five retail licenses. Seattle-based Have A Heart has more than 15 retail licenses in four states besides Washington and is actively looking to open in nine other states. Of the $9.7 million in revenue recorded by Have A Heart’s five Washington locations during the first nine months of 2018, $3.6 million went to excise taxes. Cooley isn’t a retailer, but a grower. The company he cofounded, Solstice Cannabis, sells products in 75 pot shops across the state, according to the company website, and operates its own in-house testing lab. What Cooley really wants is the ability to open a space similar to a brewpub or winery tasting room, where consumers could learn about and sample products. Such an operation is currently illegal. He’d also like the option of delivering product, which is legal in Oregon but not in Washington state. State lawmakers have considered such a plan at least twice, but the proposal has never made it out of committee. The WSLCB is considering options for delivery to patients with medical marijuana prescriptions, but no decisions have been made. Whitney cited a recent proposal to ban marijuana-infused gummies and hard candies because of their perceived appeal to children, but such edibles appeal to many adult consumers who don’t want to smoke. WSCLB Communications Director Brian Smith says the board wants to move the deadline for new regulations — still being finalized — to January 2020, which will give retailers and processors time to sell existing products and bring edibles into compliance. About 10 percent of all cannabis sales involve edibles, according to the WSLCB. The board issued a clarification last fall, saying it was merely reviewing infused edibles it had previously approved after a “reevaluation found that we had approved marijuana-infused edibles that could be deemed especially appealing to children.” West believes the state was seeking a solution to a problem that doesn’t exist. Statistics back him up. The American Journal of Nursing says marijuana use among people between the ages of 12 and 17 declined during a two-year period after the state legalized recreational marijuana. West accuses the state of engineering a bait-and-switch, arguing that processors built entire businesses around weed-infused products originally approved by regulators. Other observers say rules governing pesticide testing is also holding the industry back. The state partnered with the Washington Department of Agriculture in late 2016 to ramp up testing for illicit pesticide use in marijuana crops. The state touted the program as a way of increasing consumer protections, but the pesticide testing program is inefficient, says Jim MacRae, founder of the cannabis-focused consulting firm Straight Line Analytics. The Environmental Protection Agency has no standards for pesticide use on marijuana crops because the federal government views marijuana as an illegal controlled substance. MacRae says up to 42 percent of the approximately 75 tests performed each month fail, yet only a few product recalls have been initiated since pot became legal almost five years ago. MacRae is working with Seattle-based marijuana retailer Uncle Ike’s, which has five locations, on a monthly, random-testing program on product in its stores. Failed product is pulled from shelves, and if certain levels of pesticides are found on another strain from the same vendor, that vendor must provide clean testing results for six months at its own expense before Uncle Ike’s will work with the vendor again. The state “is collecting taxpayer dollars and driving the market into the ground,” says MacRae, who estimates that more than a million Washington marijuana users have been exposed to pesticides the past several years. A seeded cluster of ancillary businesses created to support marijuana-related companies is keeping a close eye on the industry’s evolution, including consultants, armored-car and transportation services, tourism companies and software firms. One is Paper and Leaf, the only cannabis retailer on Bainbridge Island. Co-owned by Steve Kessler and Brendan Hill, the drummer for the rock band Blues Traveler, the company has developed a software “ecosystem” that includes inventory management, compliance reporting and point-of-sale transaction tracking with brand-based product information for shoppers. The product is in beta testing in stores in California and Washington, including Bud’s Garage in Everett. Another is Eden Labs, a Seattle-company that makes equipment for extracting beneficial essential oils from plants, including cannabis. CEO AC Braddock, who is also chairman of the National Cannabis Industry Association, says the state “missed a huge opportunity” to become a cutting-edge marijuana R&D center focused on the health benefits of marijuana and CBD, a cannabis compound that some medical professionals claim contains potential health benefits but doesn’t intoxicate its users. Advocates believe CBD can reduce pain and anxiety and could potentially provide an effective alternative to opioids. DECISIONS, DECISIONS. About 10 percent of Washington cannabis sales involve infused edibles, which state regulators continue to wrestle with. The state recently issued its first cannabis research license to Verda Bio Research, a Seattle biotechnology company, which is conducting research on cannabinoid-based therapeutics. Even the banking industry is slowly coming along. Washington was one of 13 states that sent a letter to Congress last summer asking legislators to create a safe harbor for financial institutions serving licensed cannabis-related businesses. Most financial institutions refuse to work with marijuana-related businesses because the federal government views pot as an illegal substance, but a few banks and a handful of credit unions serve the industry, including Seattle’s Salal Credit Union. Salal sees “a rare and profitable opportunity” to be a pioneer in an emerging industry, to help advance research into the health benefits of cannabis for the chronically ill, and to protect the public from armed robberies and money laundering that large amounts of cash can attract, says Carmella Murphy Houston, the company’s VP of business services. The credit union must maintain a high level of compliance oversight or run the risk of federal prosecution, Houston adds. Seattle-based Shield Compliance is also seizing an opportunity. The company has created software that helps financial institutions that work with marijuana-related businesses manage myriad regulations and payments. The company plans to expand its services to 10 states in the next 18 months, says Chief Strategy Officer Shannon Vetto. Ten states now make cannabis legal for adults, according to the National Cannabis Industry Association, but most eyes are on California, which voted to legalize recreational pot in 2016 and began selling it last year. Marijuana advocates predict California’s actions will eventually lead to nationwide legalization. New Frontier Data estimates that California will control 20 percent of the estimated $23 billion legal market in the United States by 2025. Despite the frustrations of operating in Washington, West still believes he made the right decision to launch Mr. Bill’s of Buckley. He and many like him simply hope the state sees its way clear to removing a few big obstacles from their path. Under Washington’s marijuana regulations, the state divides licensees into three categories: producers who grow cannabis crops, processors who turn those crops into products, and retailers. While businesses can have licenses both to grow and process cannabis, producers and processors cannot be licensed to sell cannabis. Statewide, there are 151 licensed producers, 221 processors, 1,054 producer/processors and 504 retail licensees operating under a cap of 556. Some 50 prospective retailers have been unable to open the stores they planned because of moratoriums or bans on cannabis sales in their municipalities. Washington’s regulations contrast with those of Colorado, the nation’s other early adopter of legalized cannabis. Colorado’s regulatory approach is more open, says Joshua Ashby, cannabis practice chair at the Seattle law firm Lane Powell. As a result, says Ashby, Washington cannabis companies are well-positioned when they launch businesses in other states.